We just love this dress by Posh Pickle. This season it is made in a turquoisy mint green! So beautiful. The dress is an aline style perfect for monogramming and the little cape fits right over her shoulders. 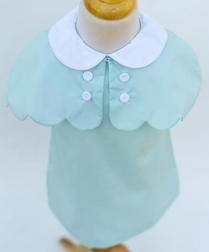 It has white buttons in the front, a white Peter Pan collar and is scalloped along the edges of the cape. 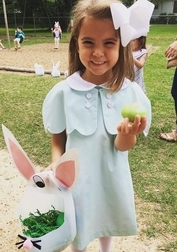 Perfect little Easter or any special occasion dress! Due to this dress running a bit small, we recommend you order 1 size larger than normal.